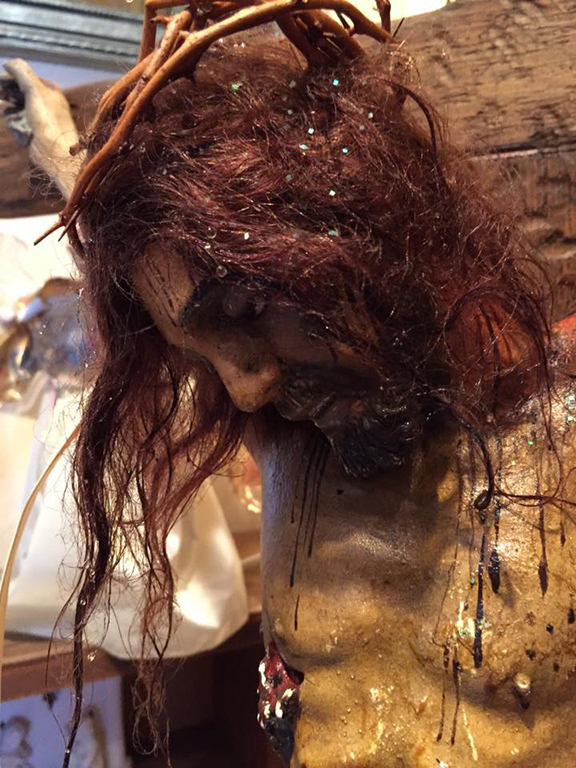 Visions of Jesus Christ.com - Escarchas appear and oil sweats/exudes on Crucifix at Audrey Santo Home. December 27, 2017 Escarchas and oil exudes on Crucifix at Audrey Santo Home. Above image from this [post] at The Little Audrey Santo's [Facebook]. January 25, 2013 In above image you can see green Escarchas/frosts in Jesus' Hair and on His Crucified Body. In the video Linda Santo talks about this statue of The Crucified Christ. She mentions the Christ Statue as having sparkles [Escarchas/frosts] on it often. Linda says they are not from the statue that they are from God. January 27, 2013 There is another [video] titled 'Beatification cause of Little Audrey Santo'. Where Rev. Jeffery Obniski I.E.V. Institute of the Incarnate Word talks (at the 37:33 Thirty seven minute, thirty three second mark) about glitter (Escarchas/frosts) saying when the priest would sprinkle Holy Water on her body, when she would be lying there looking up and gazing at the priest the Holy Water would turn into glitter (Escarchas/frosts). He felt it was amazing. He was taken up but the mysteries of this little girl and the healings that people would experience. Learn more about God's Little Angel Audrey at The Little Audrey Santo [Foundation] and [Facebook]. Little Audrey Santo, pray for us!